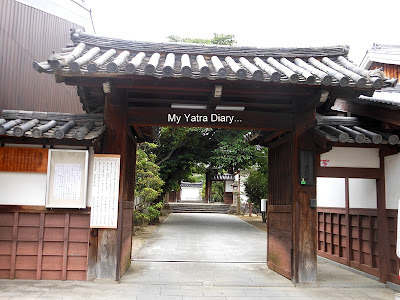 One of the best ways to discover the ancient town of Nara is to walk through the narrow streets of Naramachi - the former merchant district of Nara - that helps you step back in time. Lined with little cafes and stores, old buildings, merchant houses and ancient temples – the streets of Naramachi in Nara are filled with structures that have simply refused to change over the years. These are structures that reveal layers of ancient traditions, culture and history ardently preserved over ages for all the generations to come. It's a place that keeps it's promise of letting you peep into the past, by taking you along through alleys of time. 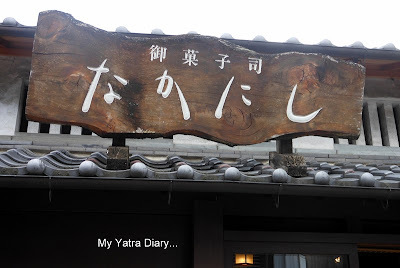 So let's discover the beauty brimming in the quietude, old worldliness and time-honored antiques by browsing through some pictures which I took while walking through Naramachi in the wonderful company of snowwhite and Redrose, the resident bloggers of Nara. 1) Monkeys - A lot of these red stuffed monkeys, known as Migawari Saru or 'substitute monkeys' can be seen hanging at the entrances - of shops, cafes, houses and temples. A symbolic deity of a local temple (the Koshin-do Temple), they are good luck charms believed to ward off evil and bring good fortune. commonly seen in Naramachi doorways. 1) Naramachi Koshi-no-ie or the Lattice House - Complete with rooms, ceiling, kitchen, inner garden, storage, etc., this traditional merchant house gives a fascinating glimpse of how life was back in the 18th century. 2) Naramachi museum - This is Mushiko Mado literally translated as 'insect cage window' because of its special type of windows but what fascinated me more about it was this huge monkey, it was also the largest that I saw in Naramachi. also the main deity of Naramachi. Dough being kneaded -- in style! Naramachi is about a ten minute walk south from Kinetsu Nara Station. It was a very good photo tour! You took us along with you through these set well sequenced photos! And it is nice to see that the people there keep the old things in its originality. The substitute monkeys are very interesting, they do not really look like monkeys. Why do they not just make something more like a monkey? I love the red entrance to the shrine, and also the writing at the shops. I have so enjoyed you series on Japan, Arti! I worked for a Japanese company until I retired and came to have such an admiration for both the people and the culture!! Hope your week has gone well! I do love that tea room. Quite beautiful and peaceful. I'm totally loving these tours in Japan and learning quite a lot, here. Thank you so very much, Arti. Arti, Great to your post. Nice description. Thanks for the beautiful photographs. the japanese wabi-sabi aesthetic is evident in those pictures. simple yet beautifu. What a fascinating tour of Nara - it really has to be one of the most charming places on earth. Lovely shots revealing glimpses of history! I did not notice you clicking so many shutters while walking with snow white and me! Only one thing you missed in this town was that you could not eat a sweet rice ball after pounding mochi:rice cake. You showed us a beautiful slice of ancient Japan.The shops are attractive, didn't you buy a kimono for yourself..? Love the simplicity & charm of this place and in particular your beautiful & eloquent narration ! Oh my goodness, how wonderful, I especially love these shop fronts and whilst I did know monkeys were considered lucky I had no idea they would be so prominent. Wow, A slice of lesser known Japan. So authentic and pleasant! . The place looks so elegant and neat. Nice photographs Arti. How wonderful to have two blog friends show you around. These photos are to be treasured, Arti. I am so impressed with this post and pictures. Monkeys as good luck charm! well it seems our Vanar Sena is respected in the land of rising sun also. 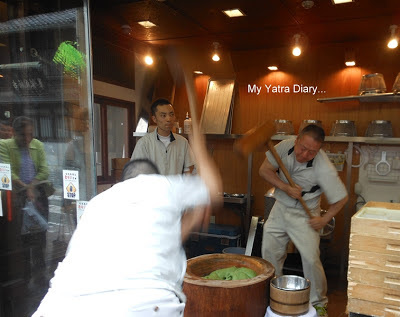 I so love this series on your Japan yatra. Wish I could visit all these lovely places someday. That tea ceremony post is one of my most favorite. The monkeys look cute. Great pictures and captivating narration. Thanks for writing this excellent series Arti. I watched with enthusiasm for your images. A lovely old town (although not so old compared to places in your country, no?) ....but what lovely tour guides you had and how wonderful to meet fellow bloggers in this way. You transport me with your photos! I hope it remains unchanged by Western influences for many many years. There is so much charm and history. And I love learning about the symbols and traditions! Thank you! Although parts of Japan is quite modern and high-tech, I like the fact the other parts have been held back in time. It is part of the charm. I was not aware that monkeys brought good luck. @Red rose: Next time, for sure! Japan is such an elusive place to me. I thank you for taking us along on your visit with such beautiful photos! There are many photos in Nara. I enjoyed them very much. Thank you for guiding Naramachi. I don't visit there too much. But I know the sweet mochi very much. They are always tasty. Naramachi provides quaint atmosphere even to Japanese eyes because the town looks unusual and old-fashioned. The town is preserved by the local people’s efforts. I usually end my Nara Park walk by eating a sweet rice ball at that shop near the Kintetsu Nara station. I’m back to blogosphere for a short while. I’m sorry to hear about your loss. Seeing from your comment on my latest post, the deceased is your grandmother? The pleasures you spent with her will be fully grown when you remember her. It’s so sad but she’ll be always with you in your heart and the spirituality you must have inherited from her would be your treasure. Thank you for the scenic tour. So beautiful! Love these images of urban Japan. Thank you for sharing Arti! Happy weekend to you! How lovely! The red monkeys are really neat. I'd have had to take tons of photos too. It's so neat to "travel" with you. oh wow, did not know about the monkey symbolizing good luck, and with lots of them, lots of good luck along the way, love the information you have been sharing to us about japan, Arti, though I still have to set foot there, but it seems I am discovering it also like you do. Happy weekend. I envy we don't have such clean roads and places in our India. i like the style of the shop , unique and simple :). How about the price there? Another round of great suggestions, Arti! I love little streets like these filled with shops and unique architecture particularly in Japan. Those stuffed monkeys are very interesting. This is a beautiful post. Love your description of Naramachi, your photos just illuminated your writing. Thanks for bringing me along on this lovely journey. Do you know how old those buildings are -- they're very well taken care of. Your posts are so informative, Arti! I'll use them again if I ever travel to japan. I hope you and your family are doing well. Arti - great info and photos in this post. All the signs in Japanese make me wonder how I'd do outside of any English speaking areas in the country. @Inside Journeys: Some of them are as old as dating back to the 18th century. The Japanese really know how to preserve their treasures of history. Interesting to learn about the monkeys. hey i was just wandering, why are you never there in any of the pics ? The narrow streets of Naramachi reminds me of the chawls of Mumbai with 2 basic difference - Naramachi's roads are more cleaner and well maintained :D Also, the tea room looks serene! Lot of pics. Nice to see this slice of Japan! Wonderful tour through ancient city. thanks for sharing..would like to visit one day. How neat,simple and beautiful life style they adopted in such a small town...! Lovely narration with neat shots. This looks really interesting place. Thanks for post. enjoyed series of post on japan. Very interesting photos and writing..all the best. Nice to go through this, again. :) It so nice to see the (traditional) architectural features on the buildings. The Japanese script by themselves add a lot of charm to those structures.